Heads up! After crunching the numbers, I now have my trading performance review for Q3 2012. How did my account fare and what can I improve on? Upon reviewing these trades, I’ve noticed that most of day trades turned out to be losses while my longer-term setups were profitable. I guess this can be attributed to the end of summer’s choppy market conditions and the start of bigger and longer trends during the quarter. Despite my 2/6 win-loss ratio, the silver lining is that my average winning trades were larger than my losing ones. My two winning trades resulted in roughly 1% in gains each, but the sheer number of my losing trades were more than enough to erase these wins. Since my recent trading performance pales in comparison to Q1 2012 and Q2 2012, I’m taking more time to review my trading journal and look for ways to step up my game. To all of my comdoll buddies who have been constantly giving feedback and encouraging thoughts, you’ve all been of great help to me and I’m hoping you’ll all still hang around for the last stretch of the year! The comdolls kicked off the quarter on a positive note as stronger-than-expected economic from Australia, Canada, and China prompted the RBA and BOC to shake off their dovish feathers. The cherry on top of the comdolls’ July gains came at the end of the month when Draghi pledged to do whatever it takes to support the euro. Sweet! Thanks to traders enjoying the last of their summer vacation, comdoll price action was muted in August. The Loonie scored 193 pips against the dollar as it was supported by rising oil prices and a hawkish speech by the BOC’s Mark Carney. Meanwhile, AUD/USD and NZD/USD fell by 126 and 40 pips respectively thanks to weak Australian and Chinese data outshining the comdoll rally brought on by QE3 expectations. 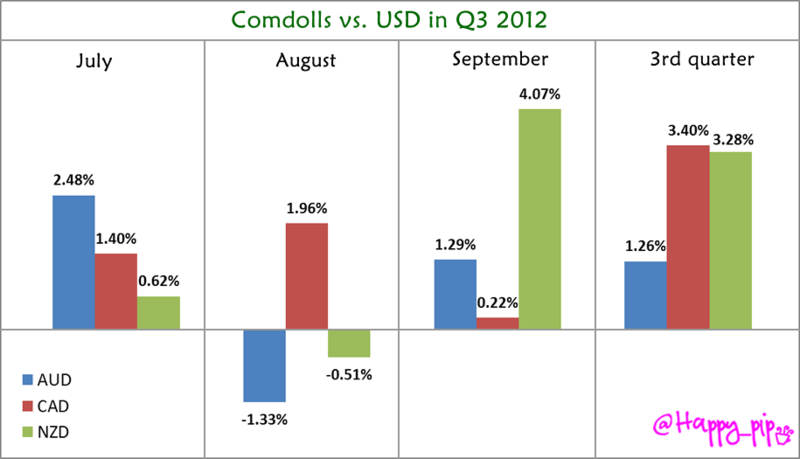 September was a good month for the comdolls as the Fed finally pulled the trigger on QE3. The Kiwi got the most out of the move with a 273-pip gain against the dollar since New Zealand also printed a surprisingly strong GDP report. The Aussie and the Loonie only got a small piece of the QE3 action as weak Chinese, Australian, and Canadian data limited AUD’s gains to 86 pips and CAD’s gains to 51 pips. After tallying up the scores, I’m giving the crown to the Loonie as the strongest performing comdoll against USD in Q3. In fact, the Loonie is the strongest performing major currency against the dollar in Q3 with a 341-pip gain, followed by the Kiwi which posted a 275-pip uptick. The Aussie isn’t too far behind though, as it’s sporting a 103-pip increase. With numbers like these, it’s no wonder why more and more people are trading the comdolls! 1. QE3 maybe? QE3 finally! Perhaps the biggest market event that took place over the last three months was the Fed’s decision to finally implement the much-awaited QE3. After a couple of months’ worth of weak U.S. economic data and a disappointing August NFP figure, the U.S. central bank decided to pull the trigger and announce an open-ended bond purchase program, combined with an even longer period of low interest rates. Although the U.S. economy definitely had this coming and expectations had been priced in for quite a while, the comdolls were still able to benefit from the dollar selloff that took place after the announcement. However, the anti-dollar rallies failed to last as several market participants realized that additional stimulus would eventually be positive for the U.S. economy. For an economy that’s used to seeing double-digit growth in almost all sectors, a continued slowdown in manufacturing is definitely not the most welcome news in China. Recent PMI readings revealed that the contraction has been going on for nearly a year already as both HSBC figures and official PMIs are still below the 50.0 mark. Aside from dragging down overall economic growth, this weak performance of the Chinese manufacturing sector is also weighing on Australia’s economy. After all, the Land Down Under is China’s number one source of raw material imports. Last but certainly not least, euro zone developments still played a huge factor in swaying risk sentiment during the third quarter of 2012. As always, there were a few bumps here and there, but several positive developments also took place. For one, the German high court’s approval of the ESM ratification boosted risk appetite as traders considered this as a sign that the euro zone was on the right track in solving the debt crisis. Another positive development was the ECB’s decision to ease monetary policy and pump up liquidity in the region. However, the progress made was met with several challenges as anti-austerity riots in Spain got more violent while bond yields spiked every now and then. It’ll certainly be interesting to see how euro zone debt concerns could continue to affect risk sentiment for the next three months! Any ideas on what else we should watch out for this coming quarter? Don’t be shy to share ’em with me!